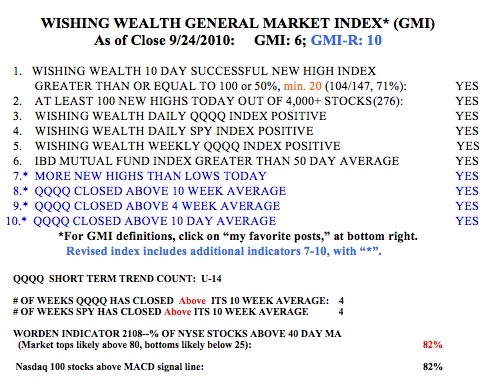 “It continually amuses me how people call into these radio commentators and ask them for their advice about when to buy and sell, when all have shown an inability to predict these major declines. Each day these sages offer new advice and wipe the slate clean from their past failures. Perhaps we need a system of rating their past performance for listeners–but then no one might survive such scrutiny! So far, these persons are telling the public to hang on because the market always comes back, in the long run. But as many have said, we are all dead in the long run. Noah, how long can you tread water? I am pleased that I have been able to avoid this decline. If you ignore all of the media and opinions and merely look at what the market is doing, you can easily see the trend of the moment. All of this interpretation gets in the ways. Just watch the averages (stocks, bonds, interest rates) and their trend lines. 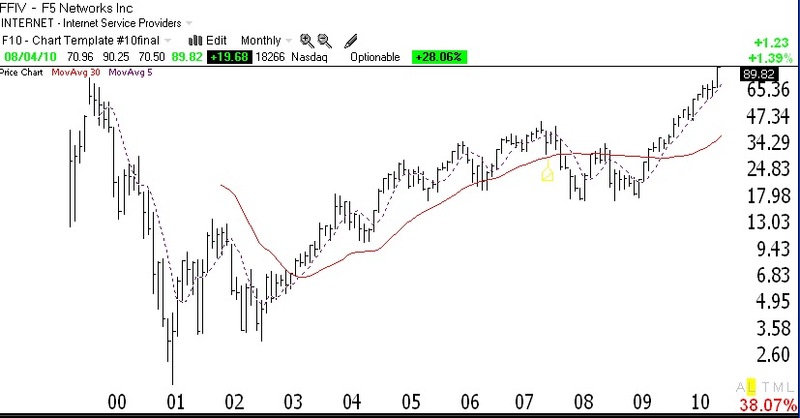 I wrote the above as part of a trading diary that provides my observations on the market and life during the great tech bull market of the late 90’s. In reviewing it this weekend I was struck by the difficulty I had as I struggled to learn how to trade. Even though I multiplied my IRA many fold over this time period, it was a very difficult journey. Don’t let anyone tell you it was so easy to make money in that great bull market–it was not, at least for me. I wrote in real-time about all of the psychological demons that sabotaged my effectiveness. The sentiment in the quote above was a large part of the reason I chose to start teaching a university course on the market and this blog. I saw so many adults lose their hard earned savings by listening to the “buy and hold” urgings of the media pundits. I wrote the trading diary ultimately to teach my sons about the market, but like many offspring, they appear uninterested in learning from their dad’s experiences. One day I might publish this diary for others who might seek to benefit from my musings. Any interest??? 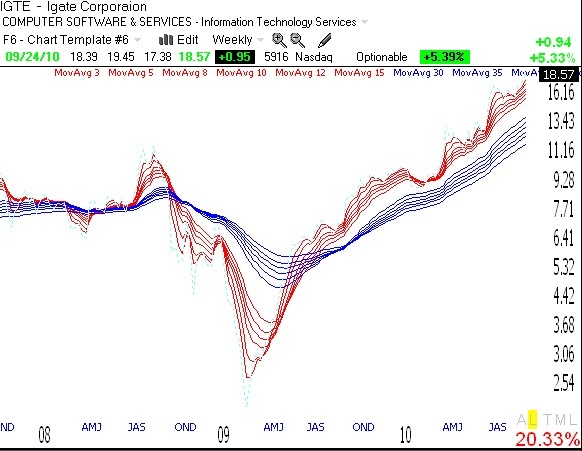 I believe we are at a critical juncture in the market. There are many signs of strength and given the fear and bearishness all around us, I would not be surprised to see Mr./Ms. Market rally. 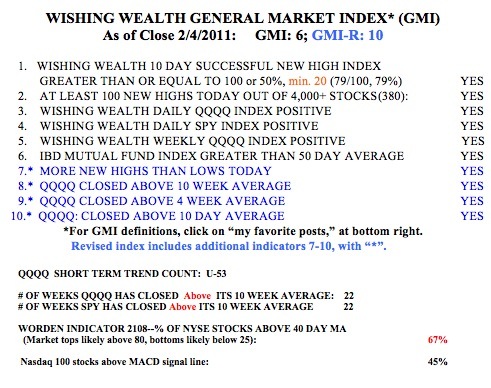 Indeed, one more strong day will turn my QQQ short term trend indicator up, after 44 straight days of a down-trend. 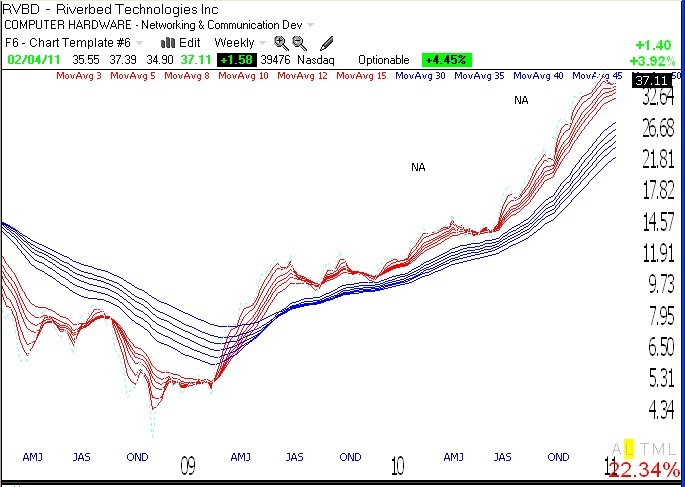 And as of Monday, IBD has now declared a new market up-trend. 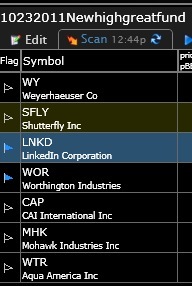 I have already closed out my short positions. Based on next week’s action I will start adding QLD or QID slowly, consistent with the prevailing trend. If an up-trend begins, I will not weigh in heavily until the 5th day. Most new trends that last 5 days can go on considerably longer. 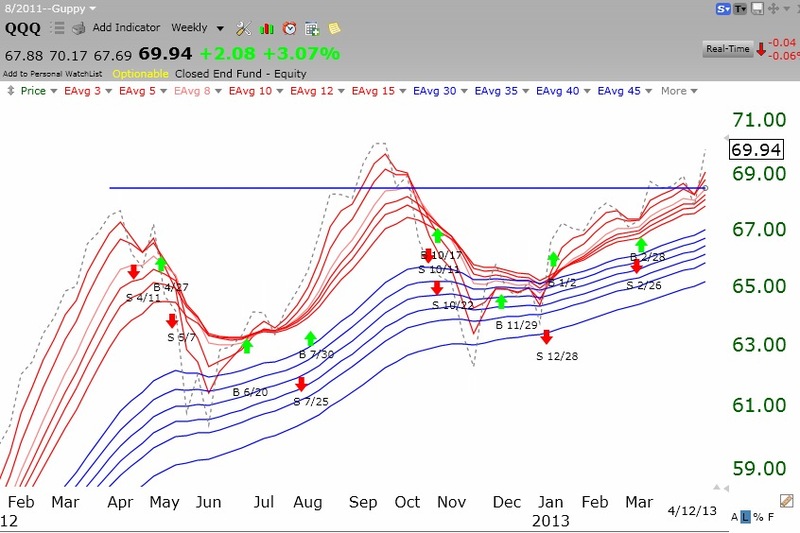 87% of the Nasdaq 100 stocks closed Friday with their MACD above its signal line, a sign of short term strength. 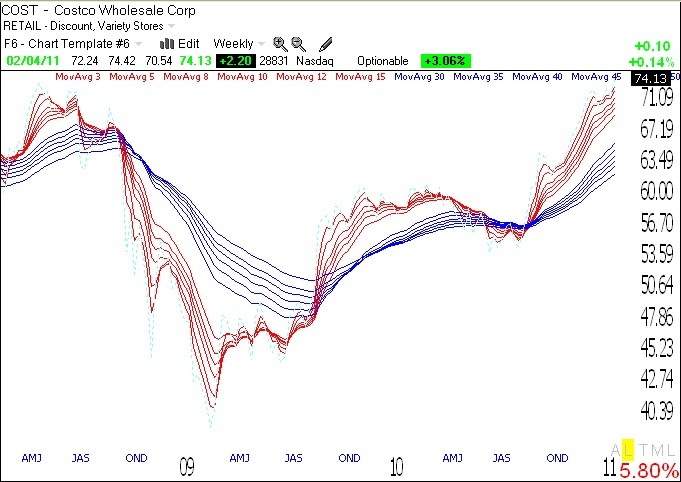 The T2108 indicator is at 39%, in neutral territory. 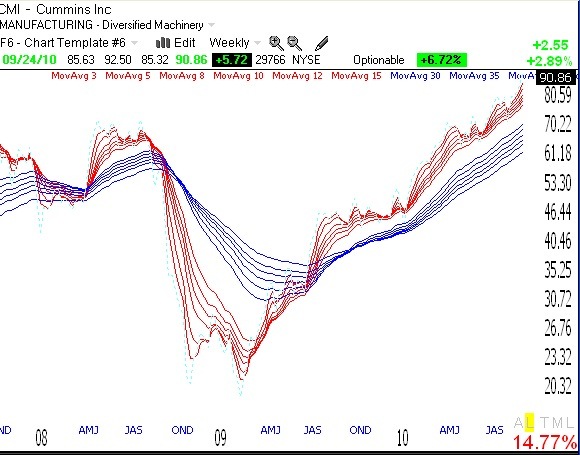 There were 125 new 52 week highs and only 84 new lows on Friday, another sign of strength. 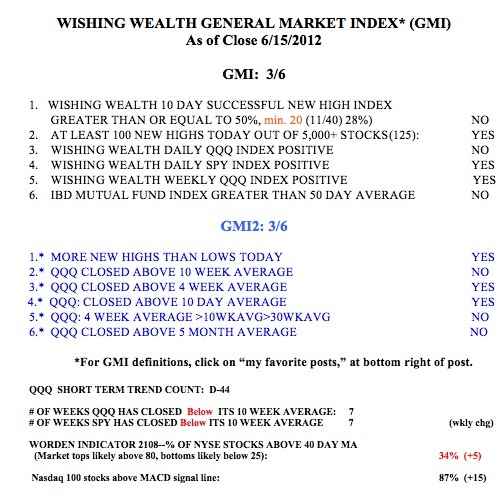 If we have a strong day on Monday, the GMI will be back above 3 for the first time since May 2. 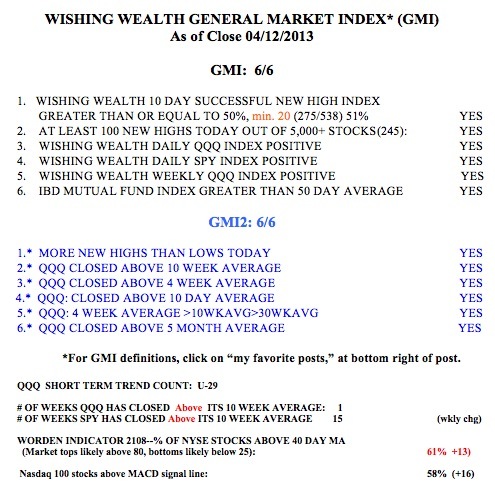 Two consecutive days with the GMI above 3 would turn the GMI signal to buy. 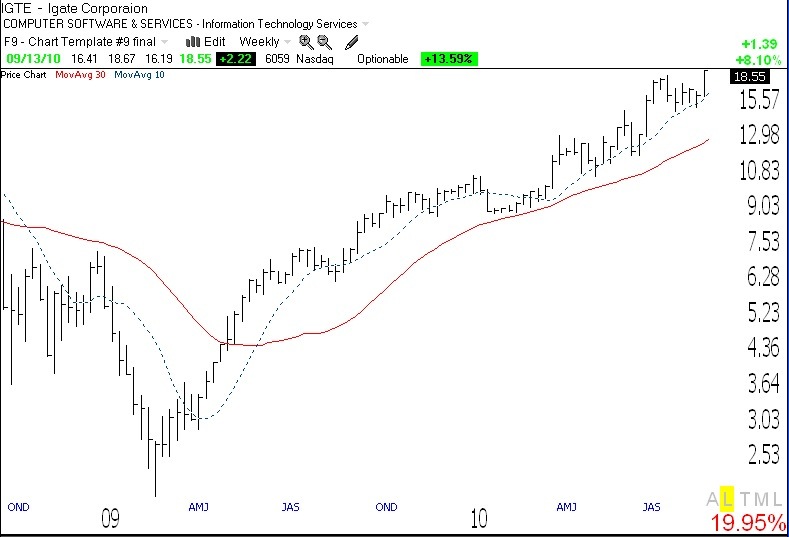 One reason we might see a rally is the coming end of the second quarter and the anticipation for the release of earnings. End of quarter window dressing is suspected at the end of each quarter as mutual funds are believed to buy up the recent winners and “dress-up” their portfolios for their quarterly reports to investors. (The quarterly reports conveniently do not specify when and at what price portfolio holdings were acquired.) I will therefore focus on the strongest stocks if the market strengthens. 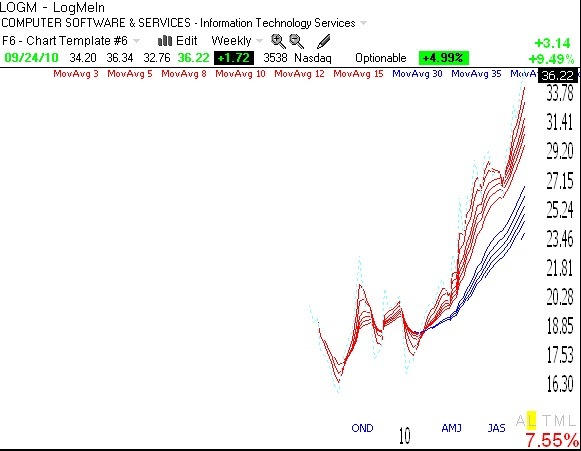 The green lines show the tops of multi-month bases. 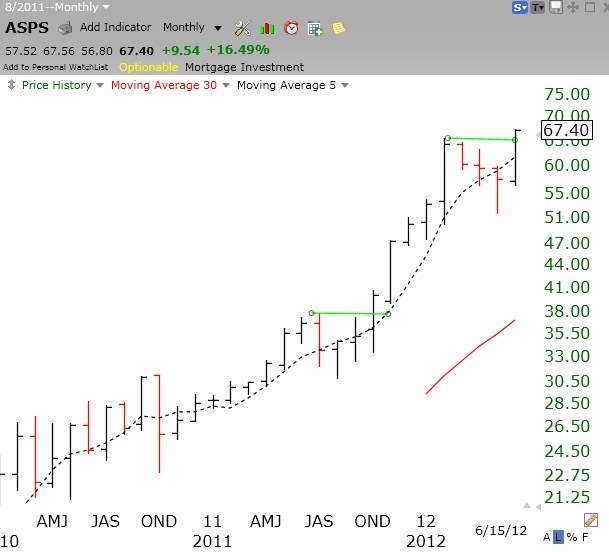 ASPS has just broken above a 4 month base. 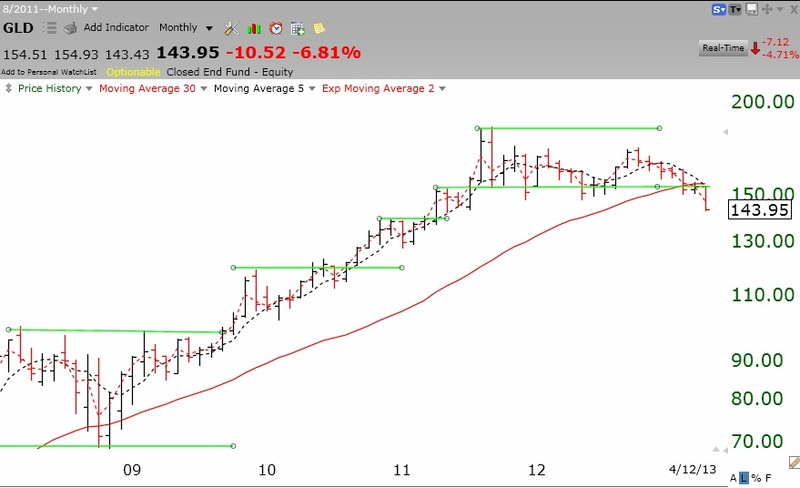 People often tell me that they want a stock that will climb higher but will not buy a stock that is at an all-time high! 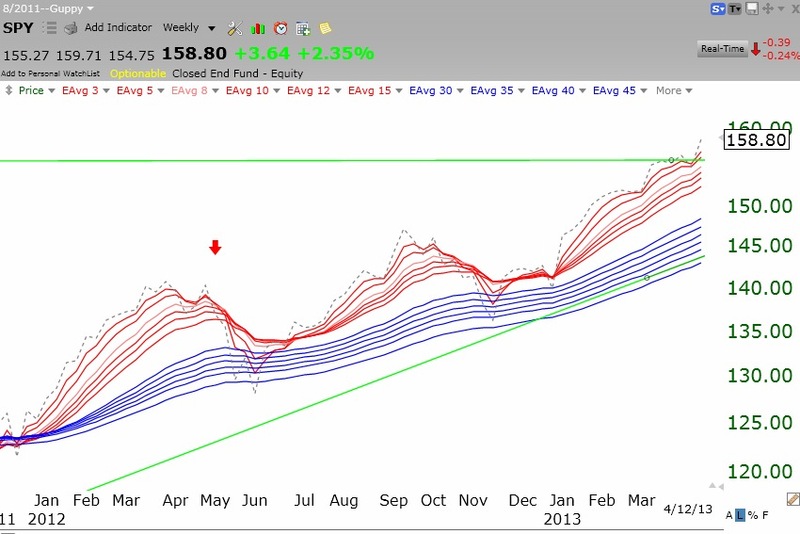 They really should look at monthly charts of great stocks. How many times do they hit all-time highs on the way up? The key to findings winners is to look on the new high list each day as a starting point. 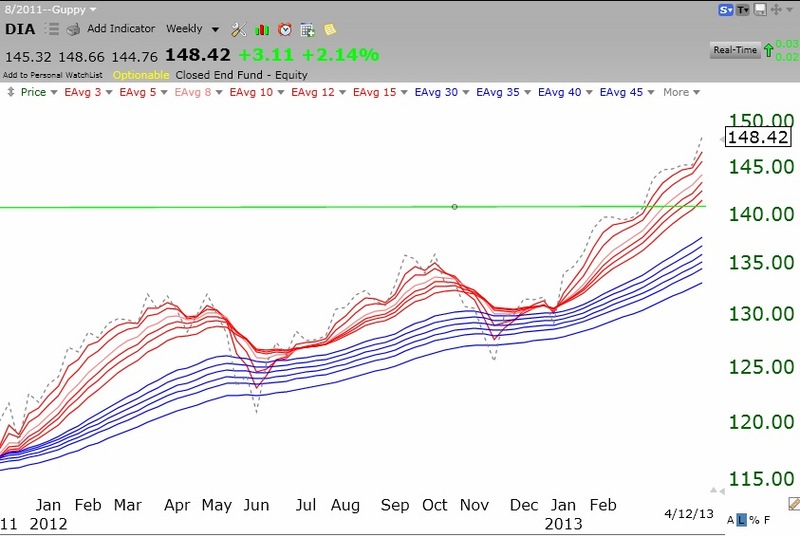 Then look at their monthly, weekly and daily chart patterns to weed out the weaker stocks. Then go to IBD and do a stock check-up. At least this is what I teach my students to do. And then, by all means, after purchase, designate an exact price to sell out if the stock fails to act as anticipated. By the way, ASPS also came up independently in my TC 2000 scan modeled after the trading strategy of the great Nicolas Darvas. His book, to the lower right, is the first one I assign to my students. It is a great introduction to the stock market and the many misleading myths about the market. 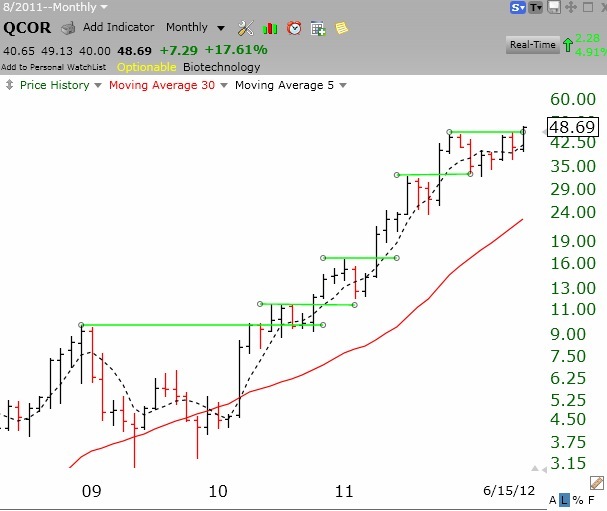 Other stocks that came up in my Darvas Scan are: ULTA and SIX and ALXN.